I can’t recall a better explanation of this doctrine. Besides I really like the movie. Read my post on John 6, which is really just the Bible text, if you want some more detail. LOL. 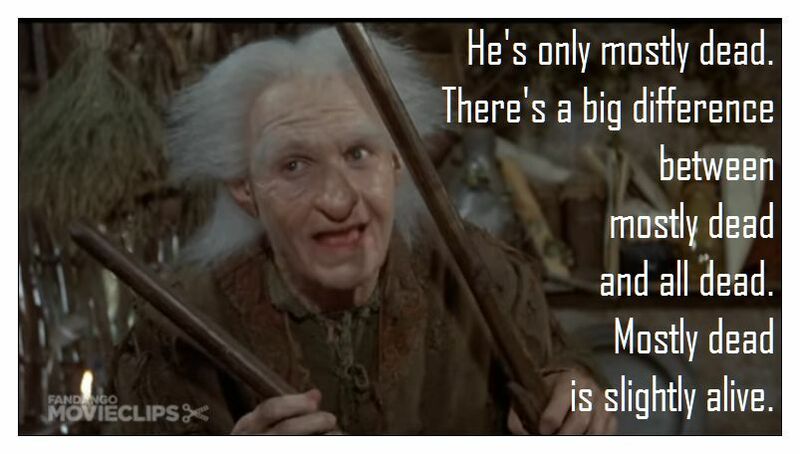 For those who might not know, Miracle Max is a fictional character in the movie The Princess Bride. Of course, the movie was an entertainment fairy tale move, not a theological treatise. But Max’s words summed up a critical difference in the two actual approaches to salvation. The Arminian believes we are slightly alive, and that in some corner of the heart, we can at some point in life choose salvation. The person who understands the Doctrines of Grace knows that divine grace is the only catalyst for salvation, and that we have nothing to do with it. God saves us. As a matter of fact, He chose every person He decided He was going to save before the foundation of the world. (Ephesians 2:1-6). There’s a big difference between Mostly Dead (Arminianism) and All Dead (Calvinism). Miracle Max, you are very wise!